We almost made it into March without the threat of strike action this year. However, Tube drivers on the Jubilee Line, working out of the Greenwich and Stratford depots, are to be balloted for industrial action. The RMT union claim the reasons for this current dispute include "bullying of staff" and a "decline" of working conditions. TfL are meeting the RMT and Aslef later this week to discuss the issues in greater detail. 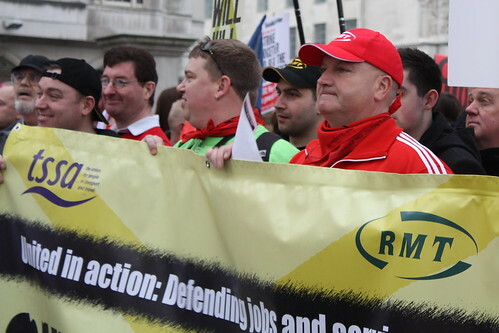 Bob Crow said: "RMT will not sit back and allow the wilful misuse of procedures on any part of the Tube network as a means of bullying and intimidating our members." "That is exactly what is happening at the moment to drivers working out of Greenwich and Stratford on the Jubilee Line and we are demanding that the practice be called to an immediate halt. 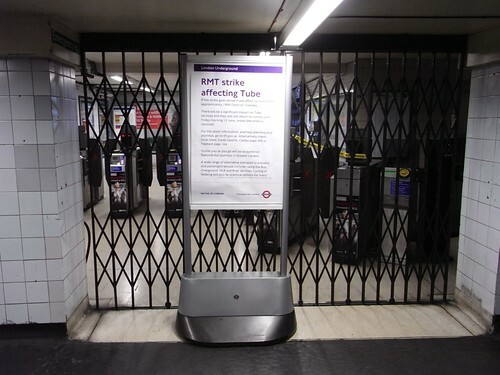 "Our members are also sick of the gradual decline in working conditions and facilities which have been allowed to degenerate into a disgusting state and which appears to be another petty and vindictive way of sniping at union members on the Jubilee Line. Communication with staff and union reps has also been undermined and support from managers for staff has been systematically stripped away. "RMT will begin immediate preparations for a ballot for industrial action and no one should underestimate the anger amongst Jubilee Line staff at the moment. RMT remains available for talks aimed at resolving this dispute." However it appears that this isn't just a war of words about TfL's behaviour as a spokesman for the union said that drivers had also been attacked in The O2 car park late at night due to poor lighting, and that their Greenwich toilets were frequently broken and left uncleaned. Surprisingly this was not mentioned by Crow in the statement on the RMT website. Surely us commuters might find these reasons a better reason to strike than Crow's continual mantra about bullying from the powers that be? One tends to hear Crow mention strikes and his emotive language about vindictiveness and think "here we go again". Yet if safety and hygiene were publicised at the forefront of the complaints there might be more sympathy - who knows? Obviously while discussions are still taking place, there is still room for resolution, so keep an eye on the news. After 35 years at TfL, Howard Collins (who's been Chief Operating Officer of London Underground for the last five years) is going "down under". Later this year he'll be taking on the challenge of Sydney's rail system - City Rail soon to be re-named Sydney Trains. Collins who visited Sydney a couple of weeks ago, and feels Sydney's system is decades behind the Tube He said: "When I travelled it reminded me of the London Underground 25 years ago in terms of the ticketing, the technology, the environment. That's what I want to help improve." 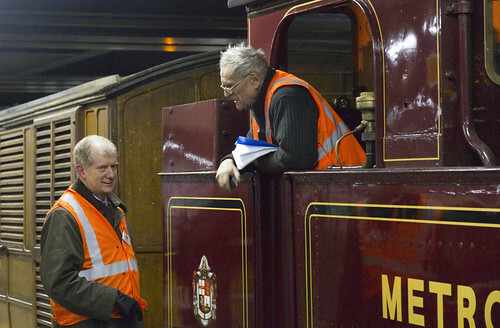 Throughout his long TfL career, Collins has done everything from driving trains, to working in signalling. As head of London Underground, Collins was instrumental in dealing with the aftermath of the terrorist attacks on our network in 2005. He also surprised critics by making sure the Tube ran smoothly during the last year's Olympics. Add putting Wi-Fi on the Tube and it's clear he's had a highly successful career and is respected amongst TfL staff and seen as part of the "old guard". He was noticeably very "hands on" during the operation of steam trains for the London Underground's 150th birthday celebrations. He was awarded an OBE in the New Years honours for his services during the Olympics. His new job as CEO of Sydney Trains comes with a $530,000 (£350,000) salary and Collins thinks he'll be "good value for money". He said "It's a big life change, it's a big move. Living in Sydney's probably one of the most expensive places in the world." In addition to investment, Collins is aware that improved customer service will go a long way to encourage more people in Sydney to get onto commuter trains. Although Sydney doesn't have an underground metro system (yet), some of the stations on the central loop are below ground. 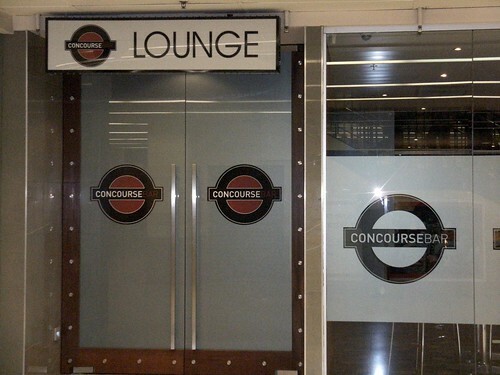 However, it appears that the roundel is already in place to make Collins feel at home (even if this is in a below ground railway bar)! Hat tip to Aussie P from Sydney who first told me about Collins' new role. I'd like to wish Howard all the best in Sydney and hope that his replacement understands railways and has the same enthusiasm for the Tube's heritage too. Maybe they'll even have the same taste in colourful ties (presuming a man will get the job!). Are there any women that reach senior positions on the London Underground or on railways in general. Probably one the strangest London Underground pictures I have seen and I've seen some strange ones in my time. 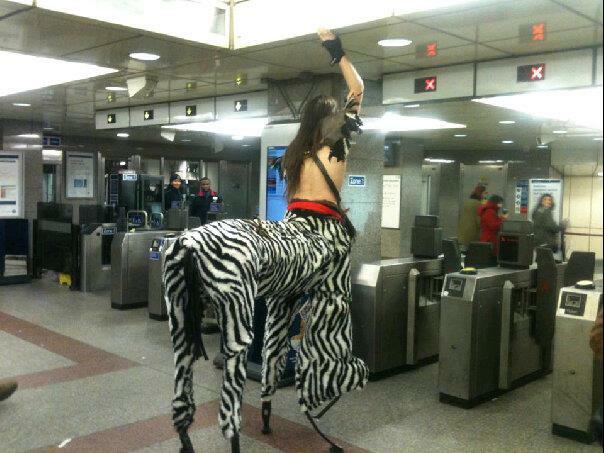 As wurding who spotted him & posted on Reddit quite rightly said "This guy was the centaur of attention on the Tube today". My mind boggles in so many ways on how he manages to walk on those feet. How he's going to negotiate any escalators (or stairs for that matter)? Is he going to fit through the gates? How's he going to fit through the Tube doors? As you can see he's pretty tall in that outfit. I love how he's managed to get Tube commuters to actually turn their heads to look at him. Most of us feel we've seen everything on the London, but this is an eye opener. He wasn't destined for Blackhorse Road, but for Angel Tube where he was off to a Rumpus: Myths & Legends party. Kudos for the costume and extra kudos for using the Tube to get the party. Regular readers of this blog may remember Shaun Buswell's challenge to form an orchestra made up of strangers met on the Tube. His project finally came to fruitition last weekend and Tube Challenger Adham Fisher has a great report of the night. "The entrance queue snaked around the corner of Shepherd’s Bush Empire, a sign of how far Shaun Buswell had come in his quest to form an orchestra entirely comprised of strangers met on the London Underground. Although, not only was he unsure of the event taking place due to low ticket sales, but he would not know exactly who was playing until the night itself due to the perilous nature of this exercise. Despite Australia Day celebrations spilling out of Walkabout next door, the ticket tout was not required. "VIP tables with gold stars, line names and gift bags were on the Empire floor and people at that level sat at them or stood against walls, below the three reasonably populated gallery levels. Everyone was in good spirits, probably more so when compere Carl Chamberlain encouraged them to talk to a complete stranger before the night was out, as Shaun had done 330 times. "Kicking off proceedings was a 40-minute documentary of Shaun’s quest and the concurrent growth of his beard, from nothing in January 2012 to substantial in November. Perhaps new hair sprouted with each confirmed musician. He took three days to find the first instrumentalist and then came peaks (targeting stations adjacent to music colleges and the Royal Albert Hall) and troughs (“I calculate that one in 500 people are carrying an instrument [on the Tube]. There are 12 people on this platform…”). One negative highlight was a man who, when asked if he was carrying a flute, replied that it was a violin, it was none of Shaun’s business and told him to go away. That reaction would have been even more worthy of television had the man actually realised he was being filmed. On the plus side, Shaun managed to snare twins, separately, two months apart, at the same station. What were the chances? "An interval followed, then Shaun introduced the orchestra one by one, including four paying patrons that had stepped in at the last minute. They played pieces by Grieg, Holst and Dvorak before Shaun’s namesake band joined them on stage to present their own songs with orchestral augmentation. It’s You began with subtle string arrangements, building to an all-encompassing, impassioned instrumental featuring a flashmob orchestra of about six in the gallery. The melodica player had apparently come all the way from Barcelona for the event. Conscious of time, some songs were dropped to make way for the medley, a hybrid of movie themes from films which feature the Tube. Hilarity and applause ensued as the audience was treated to Mission Impossible, James Bond and Superman amongst others. "Aptly deciding to leave The Road until last instead, the D major triplets pounded through the hall, Shaun having written this during and for his challenge, telling us not to give up on something however difficult it might be. He had a crazy idea and felt like quitting, but he went from that first tentative Tube talk to a renowned London venue, and that is just one example of what can be done. This might even see a legacy; I wait to hear of a band formed in such a fashion. "Ropey at times, yet successful for what it was, the Underground Orchestra triumphed. The audience stood for an ovation, their claps and cheers carrying their warmth and respect towards the stage. Originally this was planned to take place on 12/12/12, but for various reasons it was put back – the first full rehearsal happened on that date instead. Perhaps that was for the best, however, as it was more than fitting to have this show in the Tube’s 150th anniversary year. The primary reason Shaun met his collaborators was because of the Underground, and this showed the creativity and fraternity that being on the system can produce. Transport for London would have done well to list this event in their official anniversary programme. Well done, sir."